Smart City technology is gaining global popularity at ever-increasing rates and will soon be the standard for developed cities. This technology offers a wide variety of potential uses, but perhaps the best first step to take is with lighting. Smart City lighting consists of replacing standard street lights with LEDs, then connecting the LEDs to sensors which can dim lights, schedule lights, add traffic-based triggers, or add emergency response triggers and more. Lighting is one of the quickest ways to get a return on your investment, and to set the stage for a city to add further Smart City improvements in the future. Fybr has a unique and innovative Smart City lighting platform, which is easily added on to existing LED streetlights. By gathering data and gaining control of lighting, cities can improve upon the already impressive energy savings LEDs can offer. Switching out conventional street lights with LEDs can save a city up to 80% of their light-based energy expenditure, and Fybr’s Smart City platform can save even more energy. Fybr’s platform does more than just conserve energy, it can also improve safety and convenience for citizens. 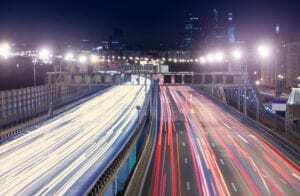 The interconnectedness of Smart City technology allows public works teams to view a city’s lighting from a different angle so that they can see which lights or areas consume the most power. This information is paired with traffic and pedestrian activity patterns to optimize a community’s lighting. Fybr’s Smart Lighting platform can give cities real-time information about each individual light’s status, so that the moment a light becomes malfunctional it can be repaired. The rise of Smart City and IoT technology has stirred up excitement about all the different ways a city can be made more efficient or optimized for its citizens. Such an explosion of new technology can make things slightly overwhelming for newer cities, but by implementing a quick and easy Smart Lighting platform like Fybr’s, a city can enter confidently into the ranks of a truly Smart City.